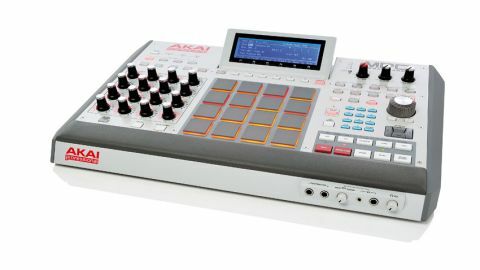 Renaissance has the potential to surpass Maschine but it's down to Akai to swiftly fix early gripes. Workflow is as slick as legacy standalone MPCs. Software is well thought out and very versatile. Built-in 96kHz, two-in four-out audio interface. Buggy when used as AU/VST plug-in. Missing hardware waveform zooming and beat roll (auto beat fills). Since the launch of the Akai/Linn MPC60 in 1988, the Music Production Controller has become legendary as a beat-making machine. Now, no doubt inspired by the success of Native Instruments' Maschine, Akai has entered the world of the hardware-plus-software beat machine with the new MPC line. "Renaissance's hardware is impressive. It's solid and weighty with nice rubberised plastic ends and a metal chassis"
Renaissance's hardware is impressive. It's solid and weighty, plus there are nice rubberised plastic ends and a solid metal chassis. The pads feel similar to the MPC3000 (firm and responsive) and there are now eight pad banks (though only 64-note polyphony). Each pad can light up yellow, orange, green or red to show velocity levels, note events and functionality/links - a move recently adopted by its rival Maschine. The new metal jogwheel is solid too, as are the 16 assignable Q-Link dials (with LEDs) that give much-needed visual feedback whether controlling the MPC software, or external plug-ins. The tiltable screen does its job well - though we'd like it to be a bit brighter - and the wrist rest, transport and overall colour and control scheme are also a nice throwback to the 3000. Only time will tell how the switchgear, screen and dials hold up but right now they seem tough enough. At the back there's a dual-port USB 2.0 hub (why no USB 3.0? ), four balanced jack outputs, two combo jack/ XLR inputs with phantom power, two phono inputs, two headphone jacks (mini jack and normal jack) S/PDIF in and out, plus two MIDI ins and four MIDI outs. It's great that a two-in four-out 24-bit 96kHz interface is included (a first for an MPC) and Renaissance sounds clear and punchy enough to hold its own as a dedicated audio interface in your studio. The install is via DVD for all content but a download file upon registration would be better to guarantee future proof upgrades, especially as DVD drives are starting to be phased out on some laptops/towers. The MPC software operates in standalone mode or as a VST/AU plug-in from within your DAW, however that VST/AU is still early work and not bug free just yet. For a comprehensive list of bugs/missing features go to www.mpc-forums.com and check the Renaissance forum. There are a few major bugs worth mentioning here. The transport controls don't work on the hardware when the MPC is used as a plug-in in Logic (they work fine in standalone mode but as this is likely a mapping issue), and we weren't able to sample into Renaissance when the MPC was used as a plug-in in Logic but again, no problem in standalone. We were also unable to use the audio mixdown/export feature as it's missing from the AU plug-in (works in the standalone) but all of our AU/VST plug-ins loaded eventually. "Let's not forget Maschine was pretty buggy and feature-light at first and is now an industry fave"
Right now all features are up and running perfectly in standalone mode and it's there that the software proved well thought out and, after more than a week of heavy use, it didn't crash once. Let's not forget Maschine was pretty buggy and feature-light at first and is now an industry fave, so we're prepared to give Akai some bug-fix breathing space for now. There are 12 main tabs of operation in the software. 'Main' is the main operating mode where you set up loop length, time sig, track type (Drum, MIDI, or Plug-in for triggering AU or VST software instruments) and assign real-time/editing functionality to the Q-Links. Timing correct (quantise) and timing shift also reside here and there's an additional strength function but still no real-time quantise. The swing/feel and sequencer tightness/MIDI timing is absolutely in the pocket. The amount of pad-to-sound latency is undetectable at Logic's 32-sample buffer size but if there's lots running in your DAW, and you need to increase the buffer size, be prepared for some latency. Alternatively, use standalone mode, which has little to no latency, and then export your beats to your DAW for mixing. Beats can be exported as a whole, or as separate tracks in MP3, WAV and AIFF formats (from 8-bit to 32-bit and up to 96kHz). Program Edit mode is where you assign, tune and layer samples (up to four per pad) set velocity ranges (so that you can fade in different layers at certain velocities) plus you can choose from 29 versatile filter modes, including the MPC3000 LPF (which sounds spot on next to our 3000), tweak the filter/amp envelopes and assign an LFO to pitch, filter, amp and pan. You can also add four insert effects per program and use Keygroups to map samples chromatically across four layers and an 88-note range, which is great for sampling a Rhodes, piano or synth. Program Mixer mode allows you control over panning, level and effects on a per pad basis, while Track Mixer mode does the same job but for each of the 128 tracks within a sequence. Track View mode is where you edit sequences using the track view window at the top to make global changes (volume, mutes etc) and the bottom window to add/remove/edit note data and automation, like your DAW's piano roll. It's a joy to have this level of control over MPC beats and although there is a small initial learning curve, the excellent PDF manual will keep you on track. Further to this, Song mode enables sequence chaining, Next Sequence mode allows sequences to be triggered from the pads and Sample Record mode is for sampling/resampling. Pad Mute mode enables muting of pads within a beat, or groups of pads (all kicks, hats etc) within a beat. Track Mute mode allows muting of tracks via the pads (a godsend when playing live) and in Step Sequence mode, each pad lights to represent a note event, much like step sequencing on DSI's Tempest. Finally, Sample Edit mode is where you trim samples, chop them automatically into slices (along with the event data so that each slice can be rearranged in the sequencer) add them to a 'patched phrase' (containing all the slices as one new sample) or reverse, fade, normalise, gain change, bit reduce, timestretch, extract or pitchshift. Rest assured, it's all here and it works well. Missing features include no hardware waveform zooming and no one-shot sample triggering while editing/auditioning. Oh, and a quick feature request: beat roll (auto beat fills) like the DSI Tempest, please. "The workflow was always the killer MPC feature and we're delighted to say that it hasn't been compromised"
As a long-time legacy MPC user, you can't fail to be impressed by the seamless integration and amount of control/features the Ren/software combo offers, plus it can load legacy data too. Sure, a new self-contained hardware MPC with software integration would be ideal but it would cost a lot more than £699. Renaissance is a good deal considering you get a decent audio interface thrown in. But if you disagree there's always the cheaper MPC Studio (with 'lite' hardware) and the iPad-based MPC Fly on the way too. Most people now use a laptop/DAW on gigs and in the studio, so it makes sense to put the MPC's brain into software, like Maschine. The workflow was always the killer MPC feature and we're delighted to say that it hasn't been compromised. Above all, the new MPC sounds and swings like it should and it's built to last. If Akai can get on top of the bug fixes, provide the missing features ASAP and keep listening to community feedback, then there is no reason why the new line of MPCs can't confidently challenge Maschine's crown.